This song has a pickup measure with a three-beat pickup. The last measure has only one beat in order to make a complete measure. 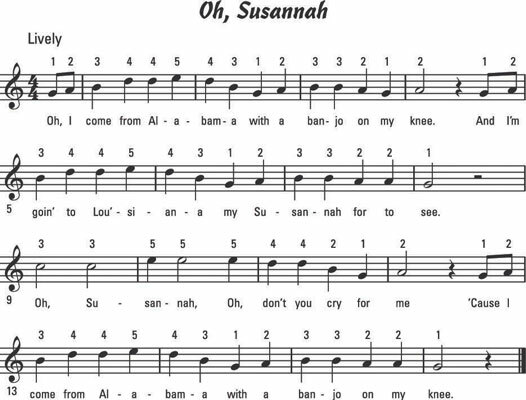 Note that this song also has ties and dots. 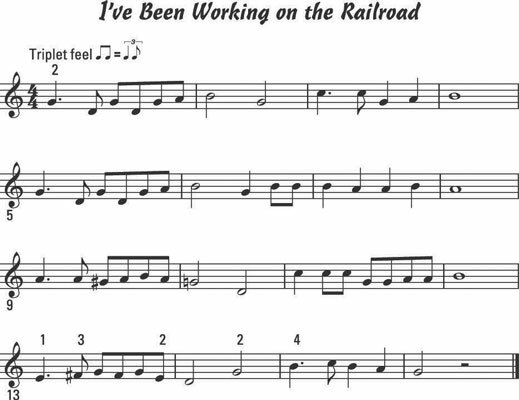 This song has two eighth-note pickups, which equal one beat and are counted 4-and. Notice how the last measure has only three beats; this is often done to complete the three missing beats in the pickup measure. Taken together, the pickup and last measure equal one complete measure. You find dotted half notes scattered throughout waltzes and other songs in 3/4 meter, like the theme from Rimsky-Korsakov’s Scheherazade. 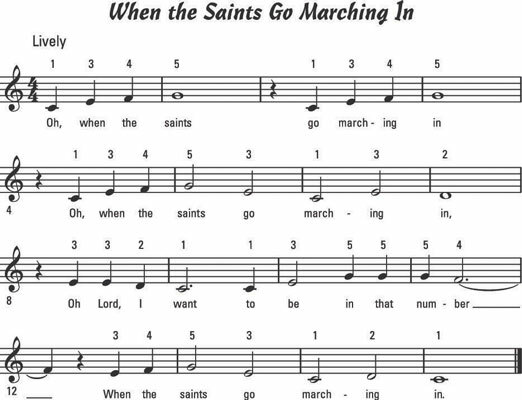 Notice that this melody combines the use of ties and dots. The tie simply adds even more time to the dotted half note. 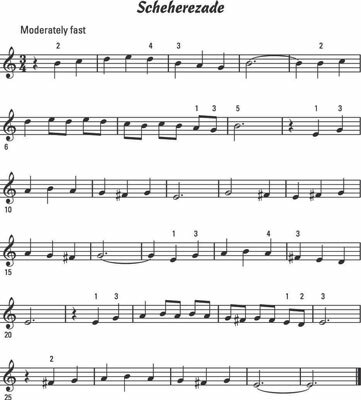 For example, in the fourth measure, you hold the B note for four beats. You hear dotted eighth notes in all types of music, but especially in dance tunes. 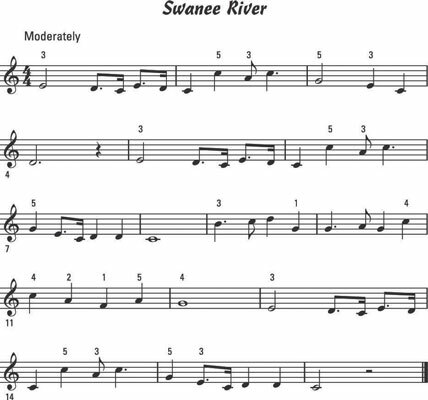 Composer Stephen Foster made good use of dotted quarters as well as dotted eighths in his classic tune Swanee River. You may want to listen to the track a couple of times before trying to play it yourself. 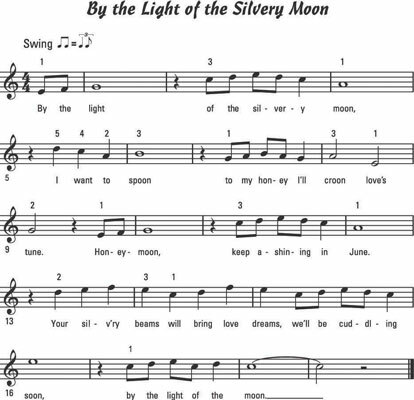 The swinging rhythm of the lyrics helps you get the hang of playing swing eighth notes in this tune. The chug-a-lug train rhythm of this song matches a shuffle feel quite naturally. The eighth notes are swing eighths, but the underlying triplet feel is a bit heavier than in a swing feel. 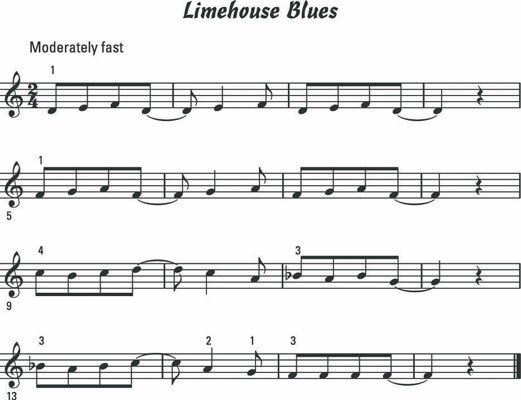 The melody to Limehouse Blues has built-in syncopation, and you get lots of practice with this tune: Every other measure has a syncopated note held by a tie into the following measure.